I have been in the situation that many people in grant-funded organisations find themselves right now. While running somewhereto_, a Lottery-funded programme for young people, I was constantly mindful of a looming deadline which was the end of our current grant agreement. We were dependent on our Big Lottery Fund grant but we knew that continuation funding was not possible and the size of the grant ruled out most other funders. We decided to try and develop a commercial offer that we hoped might reduce our reliance on grant income. Our first step was to look within - what assets do we have that we could possibly offer to a commercial market? What tradable value could we create? We developed a few ideas but, after some market analysis, decided to take our existing service offer (helping young people to access free spaces to do the things they love) and adapt it for a paying market: we would help customers to find the perfect space for their projects. Our next stage was to establish our revenue model - how could we generate money for the service? Would we charge our customers a fee for our service or could we generate income from another source? There are paid-for venue finding services but these tend to be very niche (in sectors which we didn’t have sufficient experience). The model we chose was to generate our revenue from the venues - by channelling business to the venues, we could take a share of their rental income. We then had to create our product and our route to market. We developed a new portfolio of 500 event spaces and party venues around London (including the Barbican, Roundhouse, ENO and Globe Theatre) and agreed a deal to take 10% of the income for any venues that were booked through us. 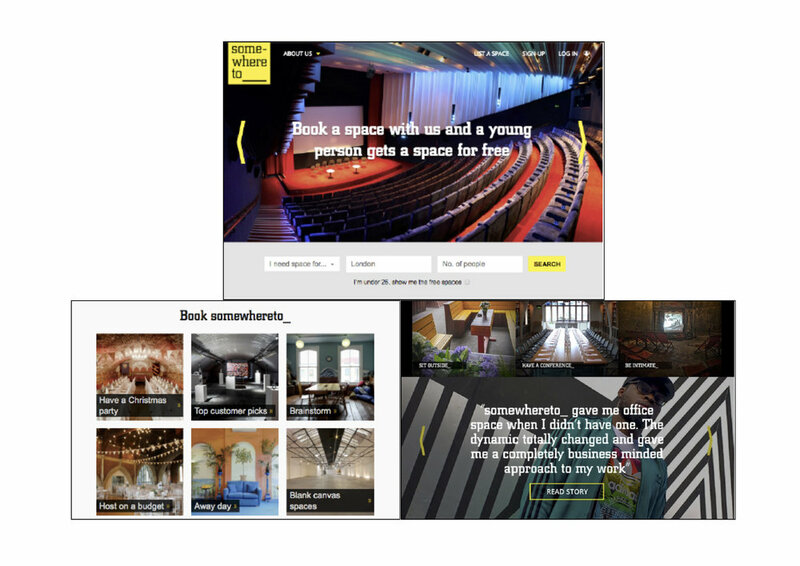 We created a new website to showcase the spaces and facilitate their booking and promoted our offer so that anyone looking to book short-term venues in London would easily find us. Our offer was simple: book through us and a help a young person to access a space for free. We became the Tom’s Shoes of venues. We launched in May 2016, started generating money in June and continued to grow 40% month-on-month from then. We ended the pilot in December 2016. Internal factors prevented us from procuring social investment but we’d proved that the model can work: if we had continued to grow at our average rate, we could have been grant free by the end of 2017. somewhereto_ is continuing in 2017 and they have a proven enterprise model that they can revert back to if ever they are in a position to secure investment. Bring in a team of critical friends to guide/mentor you along the way (and introduce you to their contacts). Understand your board’s appetite / ability to take on investment (debt) right at the start. A pro-social customer proposition is all well and good but if your product, service or customer experience doesn’t stack up against your competitors, then customers will not choose you. A model that is based on high volume / low margin also requires most elements of your service delivery to be as automated (which requires investment). Don’t put all of your eggs in one enterprise-shaped basket. Moving from 100% grant dependency to 100% sustainability will take a long time (2 years at a minimum) so try to secure some interim funding.